The first ever Battle Proms event was held at Battle Abbey, East Sussex in 1997 and here we are more than 20 years later and their popularity continues as the event has now grown into the UKs foremost picnic concert series and they are all set in the grounds of some of England’s finest stately homes. 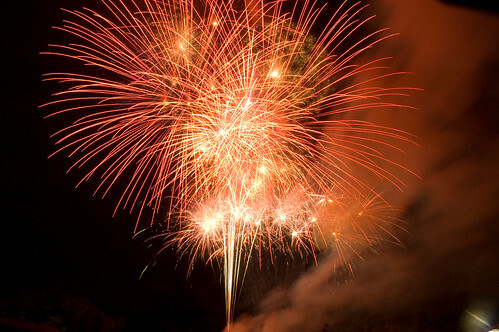 The fireworks accompanying all the fabulous displays are under the guidance of Skyburst – The Firework Company from Bristol who has collective fireworks experience of over a hundred years, they know a thing or two about display fireworks having lifted some of the UK’s top pyro awards. Oddly, the event was originally established as an answer to the ‘whatever shall we do with the 200 live firing replica Napoleonic cannons’. They were being stored at the time in the English Field Artillery Company where they were clearly being underutilised and above all, not earning their keep or their storage space so the Battle Concert concept was born. The events today even have their own little bunch of loyal followers ‘the battle promenaders’ who all simply love the opportunity to get out and enjoy a full orchestral programme of classical music along with friends and family in one or more of the stunning historical homes around the UK. Beethoven’s Battle Symphony was written in 1813 to celebrate the Duke of Wellington’s victory at the battle of Vittoria against the French. The cost varies according to when you place the order for your tickets ranging from around £30 to £50 but there are some special offers on with the likes of Virgin red-letter days where you can get two for one. There will, of course, be concessions but if you wish to make a very special day of it, why not choose one of the fantastic picnics available which include child friendly, vegan, gourmet or even just a delicious selection of cheese and wine to quaff whilst taking in the ambience of the stately home (ahhh … to live as the hoi polio do!!). They range from around £9.50 for children’s picnic to a gourmet delight, including beautiful prawn and crayfish cocktail and herby crusted slivers of sirloin of beef for up to 4 people for £210.00. Get along to one of the events on offer and keep an eye out on the internet for special offers and this could be the start of something brilliant and moreover, music, good company, great surroundings and of course spectacular fireworks – what more could you want. Are you ready for an evening of soul-stirring nostalgia and patriotism on a massive scale? Then the ‘Burghley House Battle Proms’ will be just up your street. Gates open at 4:30pm for the eleventh annual display which features classical music, a mounted cavalry lance and pistol display and a whole host of other entertainment to thrill and entertain all ages. Britain’s answer to the Andrews sisters, “the Rockabellas”, will have toes tapping as they belt out 40s themed music as the day progresses Spitfires perform aerial acrobatics to Elgar’s Nimrod before the crowd gets into their swing with flag waving to classics. As the Spitfires approach, a volley of 13lb field guns will announce the arrival in memory of the 70th anniversary of the end of the war in Europe. This year the event will be more unique as not one but two finales will take place. In remembrance of the 200th anniversary of the battle of Waterloo, the ground will truly shake as Napoleonic 200 replica cannons along with muskets, take to the fields. This is the only place in the world that you can experience Tchaikovsky’s 1812 overture in its full atmospheric magnificence, visitors travel from all corners of the world just for this spectacle. The evening culminates in a traditional rendition of British Classics such as “land of hope and glory”, “Rule Britannia” “Jerusalem” etc. as fireworks fill the huge skies in one of the most atmospheric displays available. Tickets are available on-line with a discount if purchased in advance. Starting at £36 if booked in advance or £40 on the gate. Group bookings of ten or more are able to get a further discount when booked in advance, children under five go free when accompanied by an adult, 5-15 year olds pay £17. Hampers and Champers are sure to be in abundance as many couples bring traditional picnic baskets or pre-order one for collection on arrival, also Gazebos, picnic tables and chairs are available for hire. Some concert pavilion tickets are still obtainable, starting at £240.00 for a table of four or £340.00 for six people. The pavilion tables do not include food or drink but are a great place to meet friends and catch up on the gossip. As parking is offered free of charge many will drive to the venue but consider that the venue attract up to 8000 guests for the event so as always plan ahead to prevent disappointment or delays. There is also a photography competition for the budding David Baileys among you, simply upload your pictures (maximum of six) to either www.facebook.com/battleproms or www.twitter.com/battleproms for some battleprom related goodies and tickets for future events. If you are planning you own proms for your friends and family, call us seven days a week for some of the most powerful fireworks available to the general public, and finish the night in EPIC style. The Battle Proms will visit Burghley House in Stamford on Saturday, 11 July, with patriotic anthems blending with military history to create the spectacular night. The evening will kick off with a flypast from one of the most famous aircraft in the world – a Spitfire – performing a carefully choreographed and breathtaking air display. There will also be a dramatic war re-enactment from the Napoloeonic Association, with a sensational skill-at-arms displays on horseback and on foot, expertly bringing to life the skirmishes of one of the most colourful and dramatic periods of history. After the display, the music will begin, announced by a volley of shots from an authentic vintage field gun, answered by infantry musket fire. Classic patriotic classical favourites, such as Jerusalem, Rule Britannia and Land of Hope and Glory will be performed by the New English Concert Orchestra, with soprano soloist Denise Leigh joined by the acclaimed tenor Michael Bracegirdle on stage. One of the most dramatic parts of the evening will be Tchaikovsky’s 1812 Overture and the unforgettable performance of Beethoven’s Battle Symphony. Both pieces will include the live firing of cannons, using real gunpowder, fired by the orchestra’s percussionist to the original score. The Battle Proms is believed to be the only concert in the world that includes the firing of authentic cannons, rather than synthetic explosions. The evening will conclude with a spectacular fireworks display in front of the house itself.